The insanity of covering the ground with plastic grass. I took the picture above about ten minutes from my home in Montreal. That entire expanse of grass you see between the building and the fence isn’t grass at all. It’s plastic turf. At first I couldn’t believe my eyes. The pathway on the other side of the fence is just next to the river here. It’s a beautiful walk, with the trees, flowing water…and plastic grass. Of course, the rain that falls on that plastic then runs off directly into the river. Goodness knows which chemicals are leached out and then washed down into the water. 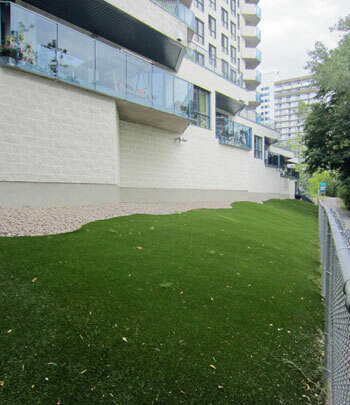 I imagine the building administrators took out their calculators and compared the cost of taking care of real grass with the cost of using plastic turf. I have no doubt that the plastic option made for a better deal financially over a period of a few years. But that’s not the point. If the value of nature could be found in a calculator I would likely replace the roses in my garden with plastic roses. I could have flowers year-round! Now think about all the plastic turf used across North America. There are probably thousands of acres of the stuff. No butterflies, no insects, no life at all within those plastic blades of grass. And underneath, in the soil? That’s probably dead too. How are worms and other life meant to flourish under a ceiling of plastic? The use of this plastic turf is truly insane. It’s a case of convenience overriding common sense. Definitely a case of “bad”plastics.